A 21st Century motorcycle is a flippin’ amazing thing. A really complicated piece of engineering and electronics that delivers amazing performance, impeccable reliability and meets loads of demanding noise, emissions and safety targets. I can just about re-assemble the carburettors on a 1981 Moto Morini, but I’ve no real comprehension about how the technology on a 2018 motorcycle actually works. They don’t half ride beautifully though. But there is more to it than technology. Because as well as delivering performance, they also have to tug on your heartstrings. Laptop computers are clever too, but you don’t want one the way you want a motorcycle. So making a decent motorcycle is pretty hard. And before you can make the bike, you have to make a motorcycle factory. That takes some impressive commitment. Every time I ride a Triumph (and last month I had a brilliant 350-mile run on a Tiger 800 XCa) I’m impressed, delighted and, yes honestly, proud that there’s a company with one of the most advanced motorcycle factories in the world, making some of the best bikes on the planet, and it’s only fifty miles from my front door. People that live a lot further away from the factory love these bikes too. That is surely worthy of a celebration, and that’s why we’ve produced this special edition of the magazine. Triumph’s range of retro twins use quality ingredients that are well prepared and simply presented. We took nine of them for a ride to Jacks Hill Cafe. 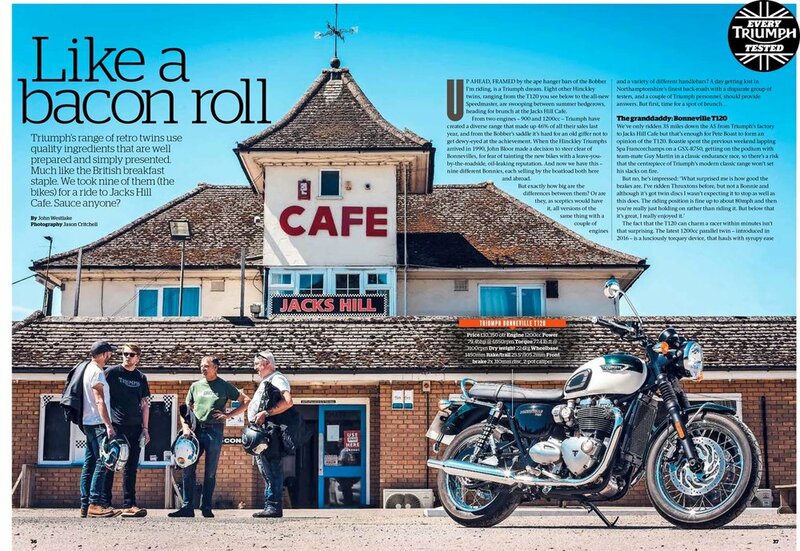 Four Triumph Tigers let loose in Leicestershire’s back country. But which one has the most back-lane bravado?